Home sales inscribed in the Land Registry surged by 25% in May 2017, according to the latest figures from the National Institute of Statistics (INE). Excluding subsidised housing there were 40,671 home sales inscribed in the Land Register in May, up 25% on the same month last year, and 41% compared to April. That’s the first time monthly sales have broken through the 40,000 barrier since September 2008. As always, remember that the INE’s figures are based on sales inscribed in the Land Register, not actual sales that took place in the month. As such they lag the market by about two or three months. Growth in May came from both resale homes (+26%) and new home sales (+10%). New home sales in April slumped by 22%, so May proved to be a big rebound. And as you can see from the following chart, the era of consistent falls in new home sales appears to be behind us. Bear in mind that the INE figures for new home sales don’t include off-plan sales, which won’t be counted until the homes are built and delivered next year. 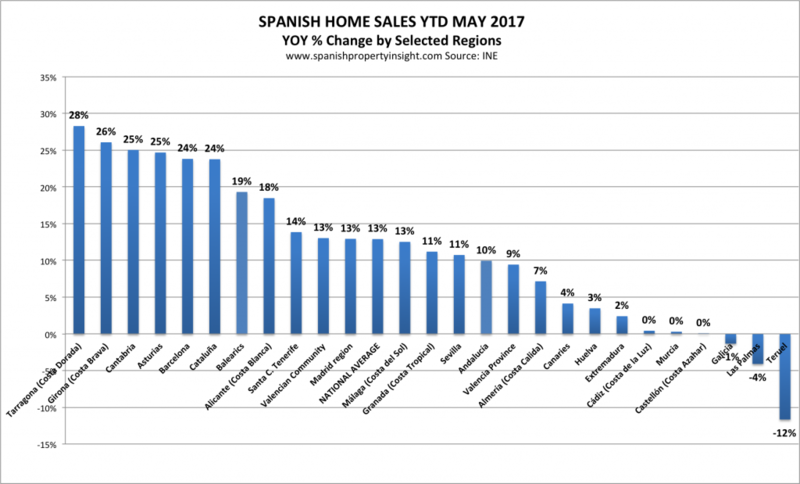 By selected region (where foreigners tend to buy), there was a massive increase in Tarragona province, home to the Costa Dorada (+52%), where the recovery has been a long time coming. It now looks like it has finally arrived. There was also a big increase in Valencia City (+43%), Girona province, home to the Costa Brava (+42%), and Almeria province in Andalucia (+40%). 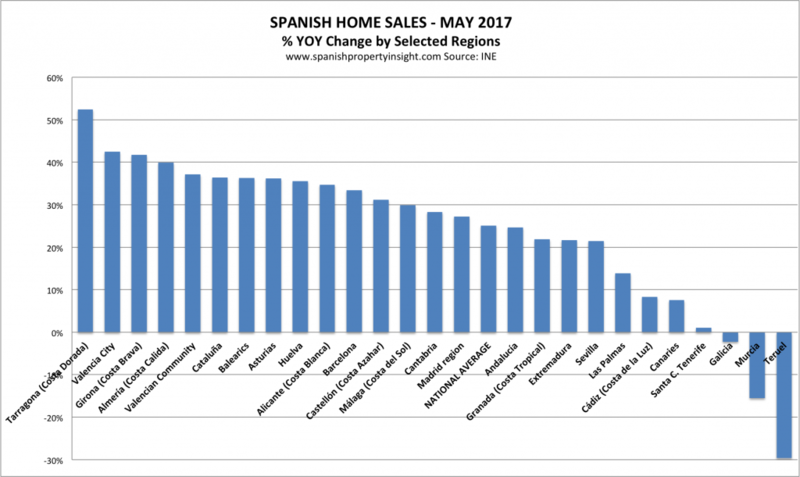 Sales were down 30% in Teruel – a beautiful, mountainous inland province of Aragon (once tipped as a hotspot for foreign buyers), and 15% in Murcia, which is popular with British buyers but not many others (I suspect). That might have something to do with Brexit. 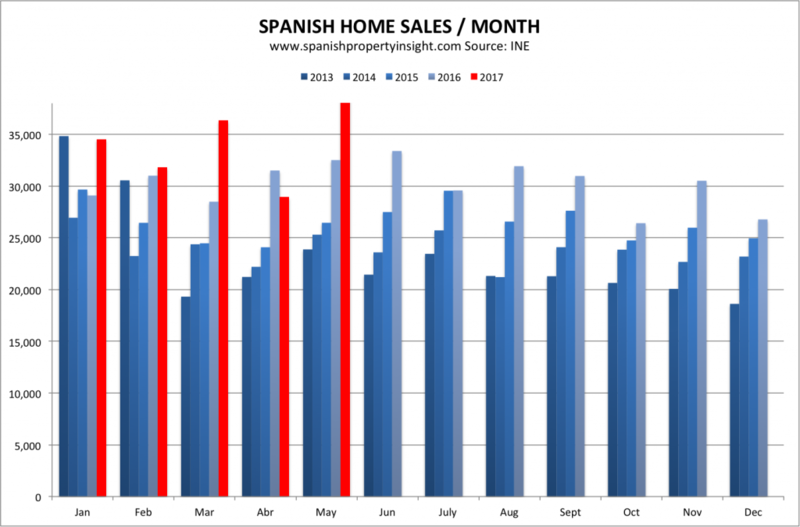 And here is the picture looking at sales year-to-date, first five months of the year compared to the same period last year. Last month I finished my article on monthly sales saying “March delivered a huge increase, April a surprising decrease. Who knows what it means. We just have to wait and see if a trend emerges over the next few months.” Based on May’s figures, the trend is still upwards and towards recovery.